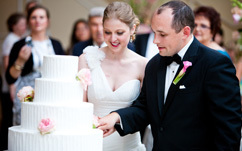 “Our wedding cake was ABSOLUTELY Beautiful and it tasted AMAZING! I had guests telling me it was the best wedding cake that they ever tasted! It was just wonderful! I don’t think that my wedding cake could have looked or tasted better! The whole process with the Baking institute was amazing!! We had a couple of delicious options to pick from at our tasting and ended up going with an almond cake with fresh strawberries and french custard inside. It is the best cake I have ever had!! The wedding cake was absolutely beautiful, I almost didn’t want to eat it (but I knew how amazing it would taste). They were so great to work with and did an amazing job for an incredibly reasonable price!! Thank you to the baking institute for making our cake exactly what we asked for. Our cake tasted so great and we received so many compliments for how good it was and the cake exceeded our expectations as far as presentation goes. During our tasting we showed pictures of how we wanted our cake to look and when we walked into our venue I was so blown away by how beautiful our cake looked and it looked even better than we expected so thank you! Everything went super smooth and the cake was exactly what we wanted. The cake tasting was done very professionally and we got a number of different combinations to try…they even let us take home the leftovers from the tasting. They were able to create the cake of our dreams with no issue. It looked amazing and also was delicious!! We cannot wait for our 1 year anniversary to indulge in the top tier. Working with The Baking Institute was so easy. When we went in for our tasting, they had the flavors that we wanted already prepared for us to taste. They were also very open to ideas about the cake design and even incorporated the lace on my dress into the wedding cake. On our wedding day I was so pleased to see how the cake turned out. It truly was beautiful and tasted amazing! Igor from The Baking Institute was wonderful to work with. During our tasting he took the time to talk with us about what we liked and didn’t like, and even asked to see a picture of my dress so that he could bring elements of it into the cake itself. Our wedding cake was stunning and it tasted amazing. The cake itself was fresh and the frosting was delicious. I was truly impressed with The Baking Institute, and would highly recommend them. Igor at the Baking Institute is a genius. He has been in business for a long time, he is talented and is a cake master!! We used the website to plan our “tasting” at the BI. The small slices of cake were all we needed to confirm that we were going to give our guests the Igor experience. We ordered a banana cake with fresh banana cream. It was to die for when we tried it. I had brought a couple pictures of what sort of cake I was thinking of for the wedding. Igor had some ideas on our cake. He said if he created it, it would be “our cake” and no one else had anything like it. I wish I could upload a picture so you could see it. When I saw the cake the day of our wedding, it blew me and my guests’ minds. It was 5 tiers, which was needed for our high ceiling venue. The cake was just beautiful. It was all cream/white colored. I did not want any color in our cake. The flowers that were placed on the three tiers were incredible. They were as detailed as Capodimonte Porcelain. It was incredible that the flowers were made out of sugar and not glass. I love Igor and his team of talent at the BI and would recommend them to everyone.